This paper introduces the concepts, methods and the implementation of a calculator for the energetic long term analysis of residential settlement structures (ELAS). 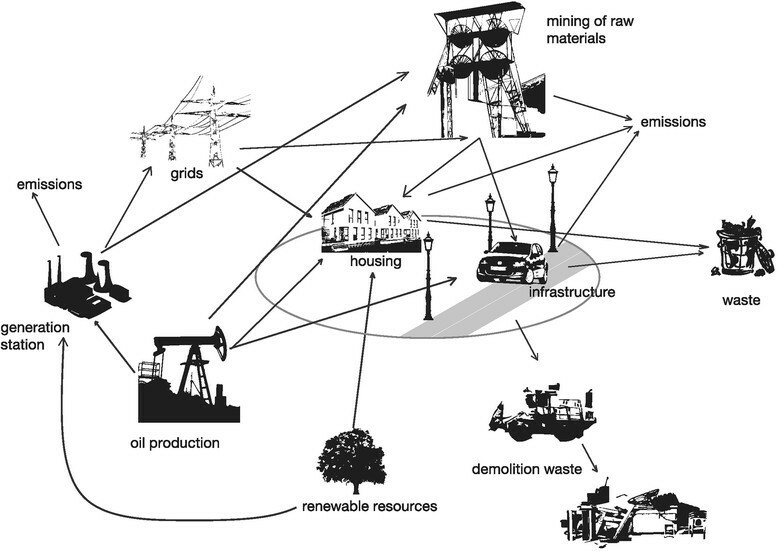 The freely available online tool addresses, on the one hand, the complexity of the environmental impacts of buildings and settlements including embodied energy and on the other hand, the mobility of the inhabitants and the necessity to provide ecological and socio-economic valuation on the base of a coherent data set. Regarding the complexity of ecological impacts, housing was represented as a life cycle network, combining the life cycles of energy provision as well as buildings and infrastructure depending on the location and supply structure of the settlement. Comprehensive inventories for these different aspects were included. They were then used to evaluate the whole system of activity linked to buildings and settlements with three different ecological valuation methods and then coupled with a socio-economic appraisal. With the ELAS calculator, a status quo analysis for existing settlements can be carried out, as well as planning alternatives can be assessed which include new developments, the renovation of buildings in the settlement, the change of energy supplies as well as the demolition of settlements with reconstruction on the same or a different site. The Energy Roadmap 2050 of the European Union aims at 80% to 95% greenhouse gas reduction until 2050 . Energy saving, energy efficiency and the shift towards renewable energy supplies have to be jointly applied in order to reduce the environmental overshoot of the current energy systems. This environmental overshoot is due to the high energy intensity of society and the extensive use of fossil and nuclear energy sources -. All sectors of society and economy have to contribute to achieve this shift in energy supplies. Households are important consumers of energy in the European Union, using up about 27% of the European energy demand within the settlement infrastructure plus a considerable part of the 33% of transport energy. Finally, 24% energy is consumed in the industrial sector, which can also be attributed to the consumption of private households to a large share (all figures based on 2009 data from Eurostat, ). Much of this energy demand is related to the dwelling itself, and concerning the mobility of persons, to the site of the residential area. Planning decisions of settlements and houses have considerable impacts on the energy demand and the technological options for the energy supply of residential areas, and, therefore, on the energy consumption of society. These decisions are not only confined to the energy consumptions of households but affect the transport sector and, via embodied energy in goods and services, many industrial sectors as well. As spatial structures are long lasting, planning decisions determine the energy consumption of society in the long term and include, inter alia, the choice of a site, the determination of the infrastructure, the building densities aspired, the energy standards and the construction materials of buildings as well as the energy sources and energy provision technology. In order to reach sustainable development, such decisions should be made on the sound assessment of alternatives including the aspects of energy demand and supply and their related environmental and socio-economic effects. Furthermore, the sustainable construction and operation of buildings and settlements will have to become a fundamental part of any sustainability oriented energy strategy. Therefore, planning tools are required that empower decision makers to recognize the long-term consequences of their actions regarding the environmental and socio-economic impacts of buildings and settlements along their life cycle. Such planning tools have to offer a sound estimation of the energy demand of settlements, and an evaluation of the environmental and socio-economic impacts depending on the energy supply. Various tools that help optimizing buildings, are already available in great number (see e.g. BREEAM , baubook , WECOBIS ). Yet, these tools still have to be complemented by further approaches in order to support a comprehensive, sustainability-oriented quantitative assessment of planning decisions related to the energy demand and supply of housing that includes not only buildings but also technical infrastructure and the mobility of residents. In order to fill this gap, we developed a model to calculate the energy demand of households related to dwelling and location, as well as its overall environmental and socio-economic impacts, based on a life cycle approach: the E nergetic L ong term A nalysis of S ettlement structures (ELAS). This model was transferred to a freely available online decision-making tool that allows assessing and optimizing settlements, the ELAS calculator (www.elas-calculator.eu). The aim of this article is to introduce the complex ELAS model and the ELAS calculator and to show how this model can support stakeholders in planning processes to take more sustainable decisions about residential development. • Energy demand for the mobility of residents, which depends on the demographic structure of the population, the supply structure and the location of the settlement. Based on these categories of energy demand and supply, an overall sustainability assessment is calculated with the following fundamental indicators: (1) environmental indicators: ecological footprint (as sustainable process index, SPI), life cycle CO2 emissions and; (2) socio-economic indicatorsa: regional economic turnover, revenue, regional imports as well as jobs created. This fundamental assessment has the quality of an ‘unsustainability’ test : Planning alternatives, that fail this test, should not be followed. If the alternatives pass, more detailed issues have to be covered applying further quantitative as well as qualitative indicators in order to guarantee sustainability in a broad perspective. Therefore, the ELAS model can help to reduce the information load on decision-makers by sorting out alternatives that do not provide the chance to strive for sustainable development from the perspective of climate change mitigation and sustainable energy supplies. ELAS can achieve that task by just using a few indicators that can be easily generated by the end users, even though the models behind this assessment are complex. The model can be applied to existing settlements as well as to planned projects spanning from (1) new settlements as greenfield developments, (2) renewal and renovation of existing settlements with/without expanding them and (3) tearing down and reconstructing settlements on the same site or on a different site. As already pointed out in the introduction, activities to provide housing permeate through all economic sectors. Basic decision like the site chosen for a building and the technical standard of a building will have considerable impact on the energy consumption during its life cycle. This has to be reflected in any reliable decision support tool. The life cycle in this case therefore more resembles a ‘life cycle-network’ with the dwelling in the centre. Figure 1 shows the life cycle network includes the construction, maintenance and operation of buildings and infrastructure like roads, sewage systems, energy provision grids. The respective life cycles consist of the provision, transport demolition and final disposal or recycling of building materials as well as of building materials with the life cycle of infra-structure, and the life cycles of the energy supply of the buildings for electricity, heating and cooling. Furthermore, the life cycle regarding the mobility of residents is taken into account. ‘Life cycle-network’ as the base of the ELAS calculator. The concept realized in the ELAS calculator is to evaluate the impact of a building or settlement as well as any planned changes to a building or a settlement (including radical changes such as demolition and construction at a different site with a different technological standard) on this ‘life cycle-network’. That means that all energy demand-and-supply-relevant impacts generated along the life cycles constituting this network are calculated and made transparent, not only in environmental but also in economic and social terms. This applies to current operation as well as to planned changes to the existing structure. As resource consumption already took place in the past, the status quo of buildings and infrastructure are not rated according to their environmental, economic and social impacts. By this approach, the users of the calculator can assess not only the direct impacts of their decisions but may also gain a comprehensive view on the consequences of their action on nature, economy and society. • Planners in order to assess consequences of their activity regarding design and changes in settlements (enlargement, change of technical standards, changes regarding supporting infrastructure and measures concerning energy efficiency and energy provision systems, etc. ), including impacts generated by necessary supporting infrastructure and induced mobility by residents. This requires that the necessary data as well as the representation of results must be adapted to the needs of these actor groups. Figure 2 shows the overall architecture of the calculator. The two principal modes, the ‘private mode’ and the ‘municipal mode’ refer to the two main user groups, private households and professional users, respectively. 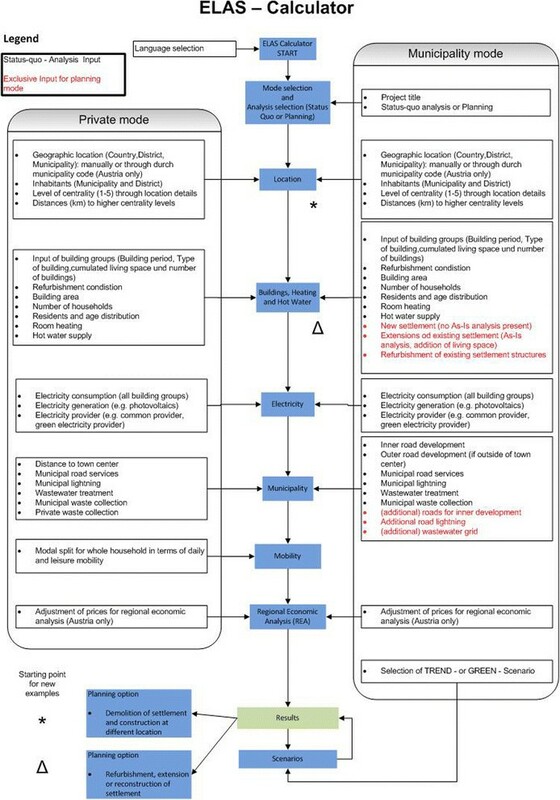 Within the ‘municipal mode’, the separation of assessment of an existing settlement (status quo analysis) and planning of a new settlement (planning mode) represent the realization of the two tasks, analysis of impacts of existing settlements and planning of new settlements. It is however possible to change from the analysis of an existing settlement to the planning mode and thus assess changes for an existing settlement. Using this option, municipal administrators as well as planners can evaluate not only direct impacts of enlarging of settlements and/or upgrading of technical standards of buildings and infrastructure but also impacts of measures of spatial planning and zoning. Architecture of the ELAS calculator. • Trend scenario: The trend scenario is based on studies by Kratena and Schleicher  and Friedl and Steininger  who estimate that the total travel distance per person will increase by 25% and that energy sources will change: biogas will hold a share of 10% of the fleet and electricity 15%. The electricity demand will rise at 2.2% p.a. Both studies yield insights into the development of gross output in Austria for different business sectors. In the ‘Baseline-Szenario’ of Kratena and Schleicher , the rise in energy prices is modest at most, and the results are comparable to the baseline scenario presented by Friedl and Steininger . It must be noted, however, that future economic projections in both models are not the result of changing energy prices as such, but are due to policy choices regarding the use and production of energy  or the sustainability of the transport system . Furthermore, projections in both models are made up to 2015/2020. In order to establish long-term effects up to 2050, we use information about long-term scenarios from Bollen et al. . They calculate future projections of energy use and production based on the ‘Four futures for Europe’ model of the Dutch Central Planning Bureau. • Green scenario: In the green scenario, the energy demand of settlements can be reduced by 33%, and the electricity supply is 100% based on renewable energy sources. As in the trend scenario, individual mobility will rise by 25%, but the share of environmentally friendly means of transport will increase and the car fleet will utilize renewable energy sources: 70% based on biogas and 30% based on electricity. The green scenario is based on several studies like Arpaia and Turrini , Polasek and Berrer , and the economic analysis of energy price shocks by Kilian . These scenarios enable the user to estimate the bandwidth of future impacts of the settlement within reasonable boundaries. Any evaluation regarding the sustainability of a settlement has to consider the spatial situation in relation to locations providing all necessary functions for residents living in it. Construction and maintenance of infrastructure as well as mobility requirements for residents depend critically on the distance between settlement and the provision of functions such as retail stores, educational institutions, health provision, administrative centres, etc. The ELAS calculator meets the challenge of systematizing this fundamental factor for the evaluation of settlements by defining different ‘levels of centrality’ that define what services are provided in the community the settlement is located in, according to Table 1. Higher levels of centrality refer to communities offering a broader spectrum of functions. The calculator offers a step-by-step help function to support the user in defining this fundamental set of datab. Using the distances to the different locations providing basic functions for residents (and using demographic information and modal split information explained later), the ELAS calculator is able to evaluate the part of the impact of settlements and buildings related to their locations. With the ELAS calculator, a quantitative evaluation of settlements can be carried out from the viewpoint of sustainable development. The ELAS calculator is grounded on a coherent and consistent model and database that allows for an appraisal of environmental and socio-economic aspects. Therefore, the ELAS calculator has the strength to quantify decisions regarding residential development including spatial planning decisions. Yet, the ELAS calculator is not designed to evaluate qualitative issues of residential developments, which are as important as the numerical issues addressed by the ELAS calculator. Such aspects include, e.g. effects on biodiversity, landscape, quality of life, social and inter-generational equity or gender issues. • Cumulative energy demand: This measure reveals the energy flows related to the life cycle network of a settlement and includes embodied energy from construction, renovation and infrastructure provision, energy for operation of the buildings and settlement as well as the mobility of residents. The measure expresses the fact that energy use causes an important share of environmental pressures and drafts a clear picture about the impacts of energy efficiency measures. • Life cycle CO2 emissions: This measure was chosen to express the effects of settlements on global warming and to assess the impacts of planning decisions regarding settlements on greenhouse gas reduction policies. With this measure, not only energy efficiency but also the contribution of different alternatives of energy sources and energy provision technologies for a settlement can be assessed. • The sustainable process index (SPI) method as one calculation method for ecological footprints: the SPI method shows environmental pressures from all material and energy uses of the life cycle network by calculating the area of land which is associated with the supply of resources and the dissipation of emissions and wastes. The SPI method is applied to compare the overall environmental impact of a wide range of planning alternatives. The three methods are described in more detail below. Energy is a major factor of the ecological pressure exerted by a settlement. The ELAS calculator accounts for all energy flows generated by the whole life cycle network. This includes the energy to operate the buildings (heating, cooling, electricity demand of appliances), the necessary supporting infrastructure (energy to operate sewage systems, street lighting, road service etc.) and mobility of residents. The calculator however also includes all ‘embodied energy’ that is necessary to provide the materials of construction for buildings and infrastructure or used in construction, renovation or demolition and disposal (when appropriate) for any planned changes to the current structure. This embodied energy is calculated using the methodology of the ‘Kumulierter Energieaufwand - KEA’ according to . Embodied energy input will be related to 1 year by taking lifetimes of buildings and infrastructures (66 years) into account. The calculation of CO2 emissions is directly coupled with the calculation of the ecological footprint (see below). All fossil carbon inputs across the whole life cycle network as explained by Figure 1 form the base of the calculation. This includes also CO2 emissions from synthetic materials used in construction of new buildings and infrastructures as well as in renovation, depreciated over the life time of the building and the renovation interval, respectively. • Principle 2: Anthropogenic mass flows must not alter the quality of local environmental compartments. The results of the footprint calculations are broken down into partial footprints for direct area consumption, fossil resource consumption, renewable resource consumption and emissions to air, water and soil. The socio-economic appraisal is based on regional economic input-output analysis : the impacts of specific economic activities on the whole economic system are estimated by modelling the economic interaction of the different economic sectors. The model applies input-output coefficients that connect the different sectors. The sectors of this input-output analysis are based on the NACE systematic of economic sectors , dividing the sector ‘electricity, gas and water supply’ into non-renewable energy, renewable energy and water supply. The economic effects of building, maintaining and operating settlements are attributed to building construction, building operation, public infrastructure construction and operation as well as external effects (primarily related to mobility). A special challenge is the regionalisation of socio-economic impacts taking the economic structure of the region - the province - into account where the settlement is situated. Applying techniques in accordance with Clijsters et al. and Baaske and Lancaster , the regionalisation of the economic input-output coefficients are based on the national data provided by Eurostat . With the techniques applied, problems of common regionalisation techniques, like the overvaluation of transformators and multipliers, can be avoided. As a result of the socio-economic appraisal, the ELAS users are provided with estimations of the regional and national turnover and revenue, the imports induced as well as the regional jobs created with the construction, renovation, operation and the maintenance of settlementsc. In this way, the socio-economic appraisal complements the environmental appraisal using indicators at the same degree of abstraction. Any meaningful evaluation tool must correlate with the requirements of a certain task within the course of taking decisions. The ELAS calculator is designed to support decisions within a planning process for buildings and settlements from the vantage point of sustainable energy systems. Stoeglehner and Narodoslawsky  provide a critique of proposed requirements for sustainability evaluation within planning processes and offer a framework for allocating evaluation methods to different assessment tasks, summarized in the indicator pyramid shown in Figure 3. The representation of this indicator pyramid reflects the fact that the information load and solid data increase along the decision pathway in planning. Evaluation should help to distinguish between alternative pathways, eliminating those that will in the end not lead to the desired goal of sustainability. The ‘tip’ of this pyramid is formed by general indicators that allow eliminating alternatives that clearly contradict the objectives of sustainable development. According to this framework, these general indicators should have a strong environmental bias, screening for alternatives that in the long term harm the natural base for human development. In order to facilitate elimination of unsustainable alternatives, highly aggregated indices (like the ecological footprint) are advantageous at this level. Position of the ELAS calculator in the ‘indicator pyramid’, adapted according to. As fewer alternatives remain in the planning process, information on the performance of each alternative increases, allowing to evaluate environmental impacts in more detail as well as adding other dimensions to the decision support provided by evaluation tools. This level of evaluation rates alternatives within the different dimensions of sustainability but aggregates data only within their particular field. The result of this evaluation then forms the base for the discourse between relevant actors who then weigh the different aspects to finally reach a planning decision for a certain alternative. The ELAS calculator is intended as a planning tool for the ‘pre-assessment level’ in the indicator pyramid according to this framework. True to its objective to support planning of buildings and settlements to conform to sustainable energy systems, it has a strong energy and environmental fundament whilst providing numerical evaluation of economic as well as social aspects of projects regarding renovation, extension or greenfield development of buildings and settlements. The ELAS calculator draws on a large and comprehensive built-in database. Describing this database in detail would exceed the scope of this article by far. The reader is therefore kindly asked to consult the extensive background material provided on the ELAS calculator homepage at www.elas-calculator.eu for specific information regarding data sources and statistical material behind the ELAS calculator. The purpose of this chapter is to explain the general approach for data acquisition followed in the development of this tool. Evaluating the complex life cycle network linked to operating and changing buildings and settlements requires a comprehensive database that must be adapted to the many specific aspects of individual buildings and settlements. It is the general approach of the ELAS calculator to allow the user as much leeway as possible to individualize his/her data in order to provide reliable decision support whilst at the same time reduce amount of data required from the user in order to increase user-friendliness of the program. Wherever possible, the program will provide sensible default values. Besides striking a delicate balance between individualization and generalization of data, the ELAS calculator strives for data coherence. This means that life cycle data are taken only from one source  whenever possible, SPI-related data where taken only from the SPIonExcel (homepage: http://spionweb.tugraz.at). Statistical data underlying socio-economic evaluation are all taken from the material provided by Eurostat as already mentioned. Many data required to evaluate the impact of the life cycle network underlying the ELAS assessment method are not available in existing statistics. This applies in particular for individual mobility of residents according to the levels of centrality that form the base of characterising the spatial interaction between settlements and services used by residents. As this aspect is a prominent factor for the sustainability of settlements, great care has been applied during the development of the ELAS calculator to come up with reliable and recent data for evaluating mobility of residents. Mobility associated with a building or settlement is influenced by a complex set of factors. Besides the distance to particular service providers (represented by the different levels of centrality and the distance from the settlement to the nearest cities associated with these levels), the demographic structure of the settlement has to be taken into account as residents within different age brackets show vastly differing mobility requirements and behaviours. The modal split used by residents to travel to service providers is in turn dependent on the centrality level of the settlement as the fraction of public transport increases with a higher level of centrality. Finally, the modal split also depends on the age bracket the individual resident belongs to. In order to obtain realistic data for evaluation of crucial aspect of the sustainability of settlements as well as to verify statistical data from other sources, a thorough analysis of ten Austrian settlements in seven municipalities, representing all levels of centrality, was undertaken (see Table 2). The settlements ranged in size from 20 to 428 households. Within this analysis, all relevant parameters about buildings and infrastructure used in the ELAS calculator were gathered. In particular, this analysis encompassed a survey of households, inquiring the demographic set up of the household, consumer behaviour and technical building standard. Questionnaires inquired the mobility behaviour of individual residents regarding frequency of travels, leisure mobility and modal split for all categories of mobility. This analysis was coupled to a participatory evaluation process in all settlements, involving all residents as well as stakeholders and political representatives, with public auditing events throughout the process. Local actors distributed the questionnaires and helped with additional information. Due to this participatory nature of the analysis, 37% of the 1,585 (i.e., 587) household questionnaires could be recovered, on top of 1,047 individual questionnaires. This statistical material allowed the formulation of 75 different modal splits linked to all 5 levels of centrality and 5 age brackets. The user has to provide all data that define the building/settlement in sufficient detail to allow for reliable sustainability evaluation. The ELAS calculator offers extensive help functions to guide the user through the evaluation exercise as well as realistic default values wherever possible. A thorough discussion of the input data is outside the scope of this paper, the user may however draw extensive support material offered on the web page of the ELAS calculator. 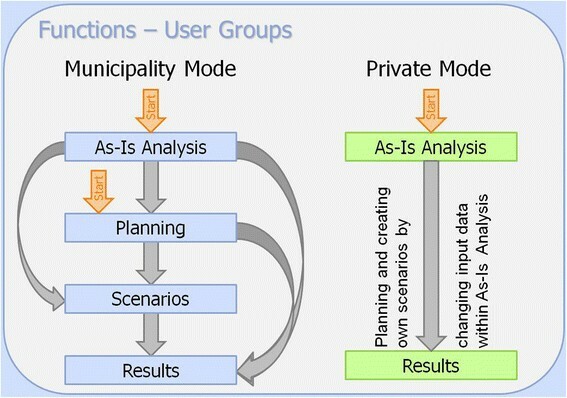 Figure 4 offers a schematic overview over the input that has to be supplied by the user, differentiated into private mode and municipal mode. The calculator is available in German and English language version. In general, the input to the private mode is less complex and geared towards an audience of interested lay persons. Using the municipal mode and in particular the planning mode requires detailed knowledge about the infrastructure of the settlement and/or about planned changes. User-supplied input to the ELAS calculator (white entries apply to the planning mode). Most sections in the private mode are in line with corresponding sections in the municipal mode (although the detail and volume of the required data differ). Starting the calculator requires decision about the language and the mode used, with the municipal mode differentiating further more into status quo analysis and planning mode. A first set of input data requires the user to identify the site in terms of the level of centrality and distances to cities of higher level of centrality. Following the site definition, the user is asked to define the buildings in terms of age categories, size and technical status, number of households and residents as well as demographic distribution of residents. On top of that, the user has to define the technology used to provide heat and warm water. In this section, buildings with the same age and technical status are subsumed in ‘building groups’. The next section deals with electricity demand, electricity provision technology mix and (if applicable) production of electricity via photovoltaic panels on the building or within the settlement. In the subsequent input section, the user may define the situation of the building/settlement within the municipality in terms of distance to the town centre as well as municipal services like road service, street lighting, waste and wastewater disposal. Following that section, users of the private mode may define their mobility behaviour in detail. The last input section allows the user to change prices and flows of goods to adapt the regional economic analysis to the actual situation regarding the settlement to be evaluated. In the municipal mode, the user may chose the ‘trend scenario’ and the ‘green scenario’ to estimate the impact of the building or settlement in the midterm future. Following the presentation of the results, the user in the municipal mode may then switch to the planning mode, adding more groups of building and additional infrastructure or evaluating the impact of any energy efficiency measures. The user may also evaluate the impact of dismantling the whole settlement and rebuilding it at a new site. Ecological evaluation results from the ELAS calculator are represented in terms of total energy consumption, life cycle CO2 emissions and SPI in graphical as well as tabular form. Using either the private mode or the ‘As-Is Analysis’ of the municipal mode will provide life cycle wide ecological impacts corresponding to 1 year of the operation of building or settlement. Results of the planning mode will always include the ecological impact of the planned infrastructure, both for buildings, renovation (summarised in the category heating) and municipal services and, if applicable, for demolition of buildings. Infrastructure will also be referred to 1 year, taking the life time into account. Graphical representation for all valuation methods will be broken down into heating and hot water provision, electricity, municipal services daily mobility and leisure mobility. 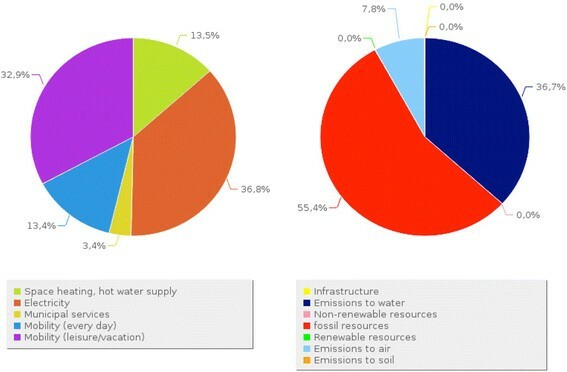 In case of the SPI valuation, an additional graphic will provide the breakdown of the ecological footprint according to infrastructure, fossil resources, renewable resources, non-renewable resources and emissions to air (excluding CO2 which is rated in the fossil resources part), water and soil (see Figure 5). SPI result for case study settlement ‘Pregartenteich/Freistadt’. Left diagram: footprint breakdown referring to activities; right diagram: breakdown into impact categories. Tabular results provide overall results as well as more detailed information, breaking down results of energy consumption into different energy forms (for heating) and applications (heating/warm water provision), electricity into grid provided and own production via photovoltaic panels, municipal services into waste and wastewater disposal, street lighting and street services. Mobility is differentiated according to the modal split and depicted for daily as well as leisure mobility. Tables relating to the SPI will also provide details about the breakdown of the ecological pressure of the different aspects of the life cycle into impact categories. Socio-economic analysis shows turnover, value added, import and jobs created, differentiated to the national and regional level in tabular form. Results will also provide a breakdown for economic effects of different aspects such as construction, operation of buildings, municipal services and external effects (in particular mobility) on the categories defined above (see Figure 6). In addition to that, imports induced by the building or settlement will be shown in the overall summary of results. The results have to be interpreted carefully, because the logic of ‘more is better’ cannot necessarily be applied to the regional economic analysis: ‘more’ in the energy sector could mean that the regional population might be restricted in other areas of consumption which would be more effective in the regional economy. Therefore, we added the imports in relation to turnover and revenue. If regional renewable resources are used, the money spent on energy aspects of a settlement will be regionally operative. Socio-economic results for case study settlement ‘Pregartenteich/Freistadt’. A multitude of ELAS calculations shows that the impact of spatial planning decisions, such as developing mixed-use structures with sufficient daily supply and social infrastructure, as well as pursuing settlement density has an important effect on the energy demand and the environmental pressures related to the energy supply of residential areas. The efficient supply with renewable energy sources can be supported, and the energy demand for the mobility of the residents can be reduced as people in more central residential areas drive less and are able to cycle, walk and use public transport. With the optimisation function for existing settlements, we explored that through integrated spatial and energy planning measures enormous positive environmental effects can be achieved. Such measures combine spatial developments based on mixed-use, short-distance supply and (moderate) density with innovative energy technologies as well as energy efficiency measures in buildings and infrastructures. They make it possible to reduce the energy demand by 30% to 50% and the associated negative environmental effects in terms of footprint and life cycle CO2 emissions up to 80%. In new developments, we found out that in low-dense settlements relying on stand-alone single-family houses, the energy demand for streets, sewage systems and other related technical infrastructures in the settlement can exceed 50% of the total energy demand of a settlement, causing up to 90% of the life cycle CO2 emissions and up to 80% of the ecological footprint. The construction of houses plays a relatively low role with around 5% share on the total energy demand. By more dense settlement structures like four- to five-floor apartment buildings, the share of infrastructures can be reduced to about 10% to 15% accounting for less than 50% of the life cycle CO2 emissions and 40% of the ecological footprint. Further determinants of the energy demand of settlements are the degree of centrality of the municipality and the distance of the settlement to the supply centres within the municipality. Decisions concerning construction and operation of buildings and settlements are pivotal to achieving sustainability and in particular to arrive at a sustainable energy system of society. This is due on the one hand to the large fraction of energy used in buildings (in particular in Europe) and on the other hand to the considerable influence the way settlements are situated has on other energy uses, in particular by shaping mobility requirements of residents and modal split of travels. As such decisions, due to the longevity of buildings, have long ranging consequences, thorough and reliable decision support is necessary. • Iterative optimisation of settlement site and settlement design. • Technical alternatives: choice of technical implementation of a project on a given site. The ELAS calculator allows to ‘jump’ between the scales: sometimes, the quality of the available sites or certain site-specific limitations hinder the implementation of system alternatives. 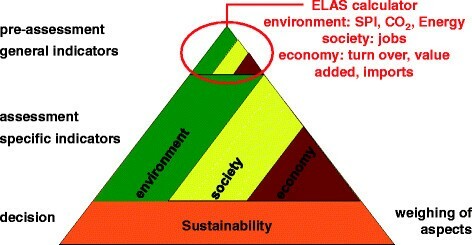 Therefore, the ELAS calculator can be used at different stages of planning processes: (1) to evaluate system alternatives with few assumptions about technical aspects of potential energy systems concerning their overall energy demand and supply and the related environmental and regional socio-economic effects; (2) to evaluate and rank site alternatives for given kinds of projects, e.g. multi-storey housing, terrace houses etc. ; and (3) to assess technical options, e.g. certain insulation or energy sources and technologies for project implementation. Finally, objectives for site-specific design processes can be set from the perspectives of SPI, life-cycle CO2 emissions and overall regional socio-economic effects. • Legal bodies (municipal mode) are enabled to assess based on case studies, how legal proposals in spatial planning, housing subsidies, building codes etc. might impact the energy demand and supply of settlements and might contribute to achieving international and national energy policy and climate protection targets. • Municipal decision-makers and planners (municipal mode) can assess local spatial planning activities (land use plans, master plans, zoning plans) concerning residential developments with respect to the environmental and socio-economic impacts of energy demand and supply. They are enabled to choose planning alternatives with a high potential to be sustainable for detailed assessments, e.g. in strategic environmental assessments. • Developers (municipal mode) are able to estimate the energy demand as well as environmental and socio-economic impacts of their future dwellers. In doing so, they can assess alternatives of sites and optimize the design of their settlement projects. Furthermore, they might use the results in marketing their products to customers interested in low energy demand and sustainable energy supplies. • Single households (private mode): Individuals can also assess their choices regarding their dwellings taking the structural aspects of the settlement and their individual behaviour into account. Especially interesting decisions situations for the ELAS application might be the comparison of different flats when intending to move, decisions about thermal insulation, change of heating devices or PV-installation, change of mobility patterns etc. so that interested individuals can choose planning options that help them to lead a more sustainable life and contribute to climate protection and the shift of energy supplies towards a renewable resource base. In the private mode, less knowledge and information is needed. Only information has to be entered by the users that is within their decision scope. Within the research carried out, it became obvious that building and infrastructure construction and maintenance as well as site-induced mobility are crucial for the sustainability of settlements. The site of the settlement is a determining factor for both. The ELAS approach addressed this by introducing different levels of centrality, differentiated according to the services available in the town the settlement belongs to. Thorough studies linking these levels of centrality and the demographic set-up of residents with daily and leisure mobility allow the evaluation of these factors within the ELAS calculator without requiring excessive data acquisition from the user. The ELAS calculator offers free accessible evaluation for stakeholders involved in long ranging decisions regarding buildings and settlements. With this tool stakeholders can readily integrate aspects of sustainability in their decisions, both regarding the operation of buildings and settlements as well as in planning renovations, enlargements or even relocation of settlements. As can be seen from the list of target groups and their potential benefits from ELAS applications, the ELAS calculator supports consistent decision-making from the policy level via the regional and local planning levels to the household level. aIn the current version of the ELAS calculator, the socio-economic evaluation is only available for Austrian cases. cIn the current version, regionalized input-output tables are available for Austrian Federal States. The model was developed by the team of authors in an interdisciplinary research project named ‘ELAS - energetic long-term analysis of settlement structures’ co-funded by the Austrian Climate and Energy Fund (project number: 818.915), the Provinces of Upper Austria and Lower Austria as well as the Town of Freistadt. Therefore, we will further refer to the model as ELAS model. The ELAS model was transferred to an open-access internet tool, the ELAS calculator, available at www.elas-calculator.eu. This paper reveals the ELAS concept, the main approaches to calculating the outcomes and the way the database for the calculation was created. All authors have contributed to the ELAS project, GS as project manager. All authors read and approved the final manuscript.